1. Age Cutoff: April 30th, per USSSA. A player’s age on April 30th, 2018 is the youngest age level he can play on until August 1, 2018. Teams will consist of no more than 20 players that meet the maximum age requirement in your age group. 3. Coin Flip: In Pool Play/Round Robin games only, the home team is determined by a coin flip. In bracket play the higher seed will always be the home team. The home team will be the official scorebook and will compare score each inning with opponent scorekeeper and umpire. 4. Scorecards: The home team will keep an official scorecard as well as keep track of pitchers used and the number of innings they have pitched. Per USSSA rules pitching innings are based on the number of outs recorded. This is calculated as 1/3 inning per out. Coaches should turn in their line-up to the umpire and the opposing coach including the player number and first and last name of all players in their proper position in the batting order. Scorecard must be approved & signed by both coaches at end of game and this becomes the official score. Be sure you are signing a correct scorecard with the correct score and pitching innings. 6. Game balls: are provided by Premier Sports & Events Management. 7. Metal spikes: allowed for 13 and older only. 8. Intentional walks: no pitches need to be thrown. 9. Dropped third strikes and infield fly rule are in effect at all levels. 10. Game time is forfeit time. For tie breaker purposes forfeit will be recorded as a 0-8 loss for forfeiting team and score will be calculated into average runs allowed. *Premier Sports and Events reserves the right to disqualify any team who forfeits in the tournament, for that event, as well as through USSSA National. 11. Pool Play/Round Robin Play: 2-3 games. Advancing to the finals can change with each tournament based on number of teams entered in each age group. Seeding from pool play could be done after 2 or 3 games. 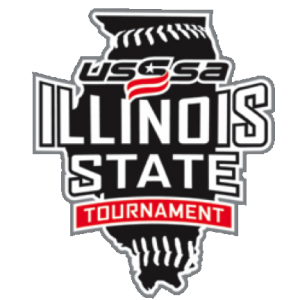 The Tournament Game Schedule will be posted on our website for each tournament. 12. Tie-Breakers: Seeding in pool play are determined by best record first, then head to head (only if all teams tied have played each other), then fewest runs allowed, then run differential with a +8/-8 limit per game, & USSSA Points. Tie breakers do not reset when a team advances out of the tie breaker. Example; three teams are tied and have not all played each other. Move to the next tie breaker and head to head is done. Team A gave up the least runs and they advance, teams B and C have played each other but that does not count as we moved past that tie breaker. B and C have given up the same number of runs so we move to the next tie breaker etc until the tie is broken. 13. Pitching restrictions; In USSSA outs recorded determine the number of innings pitched. One out equals 1/3 inning. USSSA pitching rules will apply. The USSSA inning rules are located on page 11, rule 8.05.C.5 at this link; http://www.usssabaseball.org/documents/Bylaws041310.pdf. 14. Manager visits; A manager is allowed one visit per pitcher per inning. The pitcher must be removed on the second visit. Managers must ask and receive permission from the umpire before entering the field of play and making a visit to the mound. 15. Game length: All games ages 12 and younger will be 6 innings long. Time limit of 1 hr and 40 minutes or mercy rule. All games ages 13 and older will be 7 innings. Time limit of 1 hour 50 minutes or mercy rule. No time limit for Championship game. An inning can be finished, but a new inning cannot be started after the time limit. When the last out is completed determines time limit. Time limits may be changed by Tournament Director in order to get the Tournament concluded. 16. Mercy Rule: 6 inning game will be: 15 runs after 3inn, 8 runs after 4inn, and 7 inning games will be 15 runs after 3inn, 12 after 4 inn, and 8 runs after 5inn. If the home team is winning by mercy rule at the half inning or during the bottom half of the inning the game is over. 17. Game called because of weather: 6-inning game = 3 innings or 2 ½ if home team is ahead. 7-inning game = 4 innings or 3 ½ if home team is ahead, will determine a completed game. Games suspended will begin where it left off, if not an official game as described above. Runner on second base, 1 out and a 2 -1 count on the batter. Each batter thereafter will start with a 2-1 count. The runner on second will be the last official hitter from the previous inning. Extra innings are only allowed if the time limit has not been reached. In pool play there is a maximum of two tie breaker innings. If the game is still tied after the two extra innings the game is over and the tie score is recorded. No inning can start after the time limit has been reached and if the game is tied it will be entered as a tie. 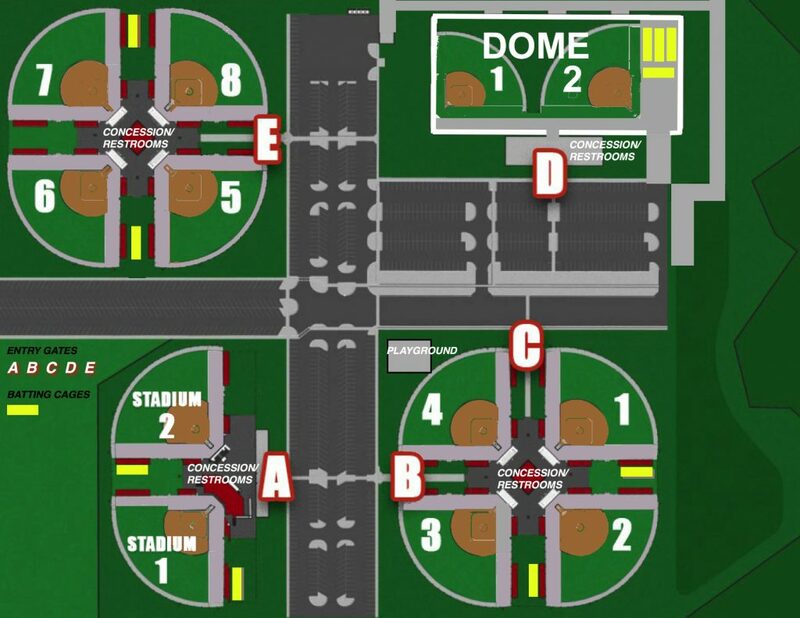 In Bracket play if the time limit has been reached, the inning has been completed and the game is tied the extra inning tie breaker rules will be used until a winner is determined, regardless of what inning was being played when the time limit was reached. 19. Courtesy runners shall be USSSA book rule 8.04.B. At any time the team at bat may use a courtesy runner for the pitcher or catcher of record the previous inning on defense. • At any time, the offensive team may use a courtesy runner for the pitcher and catcher of record the previous inning on defense. The courtesy runner must be a player not presently in the line-up. If no players not presently in the line-up are available, the courtesy runner shall be the player making the last batted out. Rule 8.04.B Comment: The re-entry status of the courtesy runner, pitcher, and catcher shall not be affected by this rule. If at any time, a courtesy runner is determined to be ineligible, a proper replacement pursuant to these rules (if available) will be used without penalty. • For teams using a continuous line-up, the courtesy runner shall be the player whom recorded the previous out. If no outs have been recorded, the courtesy runner shall be the previous batter not on base. If a courtesy runner is determined to be ineligible, a proper replacement (if available) will be used without penalty. If no proper courtesy runner is available, the pitcher and / or catcher must run for themselves. 20. DH, EH and Continuous Batting Order: DH is only allowed at the 15u and older age levels. At 15u and older you cannot use both the EH and the DH together. Teams may bat a nine (9) player line-up, a ten (10) player line-up using an Extra Hitter (EH) or a continuous line-up of all present uniformed players. Such line-up must be declared before the start of the game and used the entire game. Teams using a ten player line-up (EH) or continuous line-up are allowed free defensive substitution among all hitters. For continuous line-up, one team may bat 12 and their opponent 14 if that is the number of players available for that game. If a player is arriving late he must be inserted to the lineup at the start of the game. If his spot comes up and he is not there he will be recorded as an out. If using a continuous batting order and a player has to leave the game, for any reason, then every time that spot in the order comes up to bat it shall be an out. 21. Re-entry rule for nine (9) player line-up and ten player (10) line-up: Position Player starters may reenter the game once in their original batting order. A pitcher may not reenter to pitch again in the same game at any age level. 22. Slide rule does apply and runners must slide or attempt to avoid contact on close plays where a tag may occur. A collision between runner & fielder will be the umpire’s decision on ejection, and umpire’s ruling is final. A player ejection, based on the slide rule, is for the rest of the game and if the Umpire and Tournament Director determine it was intentional and flagrant they may impose additional game suspensions. 23. Balks; Balks will be called at all ages. At the 9 & 10 year old ages only real obvious balks will be called. 24. Unsportsmanlike conduct will not be tolerated: any player or coach ejected from a game for unsportsmanlike conduct will serve the remainder of that game, plus the next game. Whether or not a player’s or coach’s conduct was unsportsmanlike will be determined by the umpire and the site supervisor. Managers and coaches are responsible for the behavior of the entire team, parents included. At the umpire and site supervisor’s discretion, unruly fans will be warned once, and then suspended from the ballpark for the remainder of the tournament. 25. Infield warm-up is not allowed. Warm-ups must be done outside the playing field due to time restrictions. Teams can play catch in the outfield if time allows before their scheduled game. 26. Protests: to protest a rule interpretation you must put up $100 cash. The game will be delayed and a ruling made by the Tournament Director. All decisions are final. Judgment calls cannot be protested. For age challenges, a protest must be filed with Tournament Director at least 1 hour prior to the challenged player’s next game. The player challenged must show a birth certificate to the Tournament Director. If the challenged team cannot produce a birth certificate before game time then the player is ineligible until the birth certificate is shown. If player is over-age, the team must forfeit all games the over-age player participated in. If protest is upheld, the $100 will be returned, if protest is denied, you must forfeit the $100. All coaches must have your player’s birth certificates with you at every game. 27. Disrespect for the Game: any team caught intentionally giving up runs, losing on purpose or otherwise playing the game to change the outcome of pool play or the finals in favor of another team shall be dismissed from the tournament and reported to their league and any other appropriate sanctioning body. The dismissed team’s win/loss record shall stand, and the teams seeded below them will all move up and play, if qualified, based on tournament seeding rules and tie-breakers.